Elliot has always been a great sleeper most of the time but through out the Summer it was becoming a bit of a struggle to get him down at night time. Even if we put him to bed at 8pm, it could take over an hour some nights for him to settle because it was so light in his bedroom and he didn't think it was bedtime! The wake-ups were getting earlier and earlier too. He has a Gro-clock so he understands it not morning time yet as the sun isn't out on his clock but that didn't stop him from waking up mega early and shouting "mummmmmy! Is it morning yet!!!?" We moved house a few weeks ago and I soon realised that Elliot's bedroom got the last of the sunshine before it set. And it was bright!! 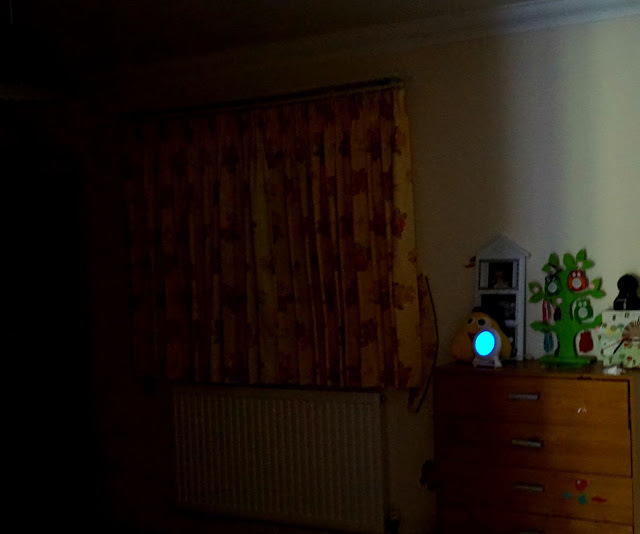 I actually thought I'd left the light on one night when putting him to bed because it was so bright in his room. The curtains did nothing to block out the sunshine so we were again struggling to get him to go to sleep. Excuse the curtains, we haven't put Elliot's new ones up yet! Gro Company to the rescue! 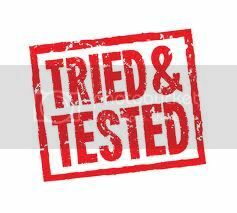 We were offered one of their lovely products to review and I knew immediately that we'd like to test out the Gro Anywhere blind. I'd heard great things about it so we were excited to to see for ourselves. What is a Gro-Anywhere Blind? 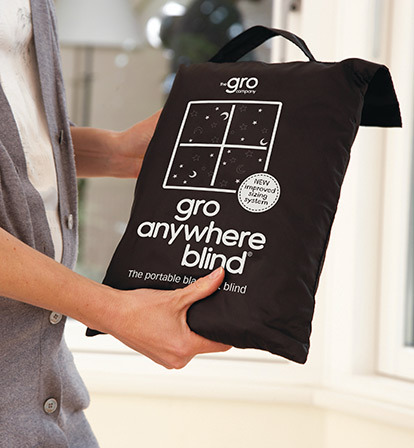 The Gro-Anywhere blind is a portable black out blind which fits any window up to 130cm x 198cm. It features a cute stars and moon design and can be handily folded away into the travel bag. It attaches to the glass using suction cups and has velcro fastening to adjust to your window size. The blind is made from good quality black out material and I love the stars and moon design. When the blind is packed away in the travel bag, it is fairly light and could easily be popped in your suitcase to take away on holiday. The blind is very easy to attach to the window with the suction cups, I just made sure I made them a bit wet before sticking to the glass. Not too wet though otherwise they won't stick at all! Elliot's window isn't massive so I used the velcro to make the blind fit perfectly. I didn't do it on the bottom too, I just folded it under and this seemed to work fine. Once the blind was in place, I was dubious to how well it would work but I closed the curtains and the room was pitch black - AMAZING!!!!! There were some teeny cracks of light at the sides but once the curtains were shut, it did it's job perfectly. The blind stayed put until morning and then it was really easy to un-suction it from the window. Because I'd already adjusted the size using the velcro, it was really quick to stick back up the next night. In a word, yes! A pitch black room combined with less naps has made one tired little boy and we've had no issues with putting him to bed at 7pm. Before if I'd tried to put him to bed that early, I would spend the next hour going into his room and trying to coax him into sleeping! Now because his room is so dark, he just accepts it's bedtime and we don't hear a peep out of him! The mornings have been much better too - he sleeps until his body tells him he's had enough sleep, not when he gets woken up by the sun beaming through his room. This morning he didn't wake up until 8am and his room was still lovely and dark! This is such a good idea, we have black out curtains in our house but neither of the grandparents do so it would be perfect for sleepovers and holidays. Ah these look great, I have blackout blinds for my daughter and they are amazing, and these look perfect for on the go! Looking so beautiful!!! I am planing this weekend for buying as like this!!! In the morning, sunshine come to my son's room.Please don't mind copying your idea. Thank you so much.